Sometimes you may encounter the issue that not all your episodes display in iTunes. You can follow the following steps to check and resolve this. 1. Verify your feed( https://subdomain.podbean.com/feed.xml) at feedvalidator.org and make sure that your feed is valid. Then iTunes should update the episodes within days. 2. If the feed is valid, but still not all episodes display, it is quite possible that the episode number set in your feed is smaller than the total episode number, for example, you published 30 episodes but the episode number in the feed is set as 25. In that case, iTunes will only display the latest 25 episodes or the oldest 5 depending on the episodes display order you set. 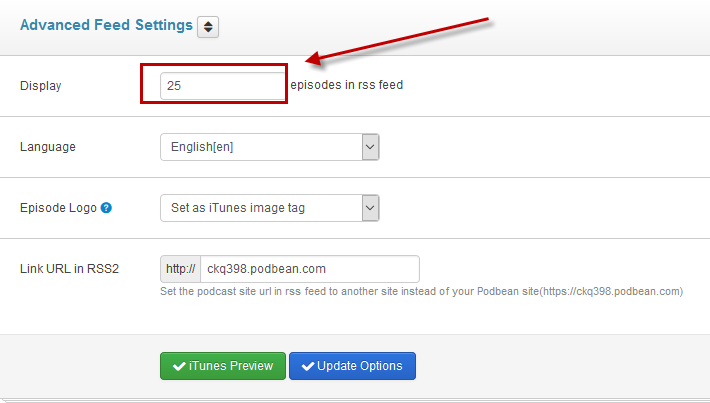 You can change the episode number in the feed in the Settings->Feed/iTunes-> Advanced Feed Settings page in your Podbean account. Then iTunes will update your feed within days.